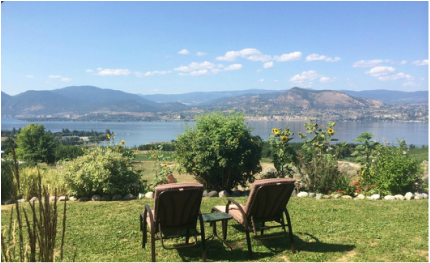 Overlooking Mill Bay and the Village of Naramata, Sutherland Blueberry Bed and Breakfast is a private suite that caters to guests who are looking for gracious hospitality and attention to detail. ​Begin your morning with a cup of fresh brewed coffee or tea and a full breakfast then retire to the 'southwest gazebo’. Surrounded by sunflowers and native grasses, watch the day slowly come alive. There is no better place to end a perfect day of adventures than here in your home away from home. Savor a glass of carefully selected wine while watching the sunset over Summerland and the night sky fill with stars. Proud Winner of Trip Advisor's Certificate of Excellence for four years in a row! !